After our exploits with roses yesterday, we decided to use the sod cutter to move some of the sod from the holding area to the places where it was originally supposed to go. This corner by the driveway is one of them. 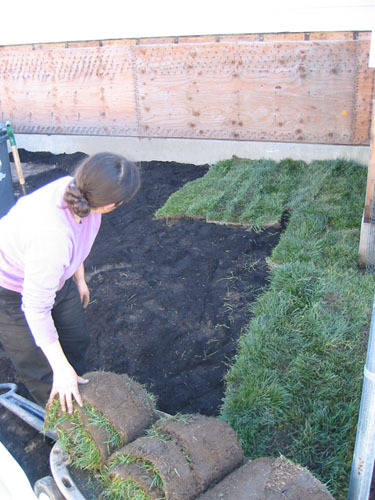 The sod cutter does a decent job of making easy-to-roll strips of sod, but it's heavy and hard to handle, and a lot of our strips ended up a bit less even than might be preferred. On the other hand, it did get a lot of grass moved in a very short time. Here's the final result. 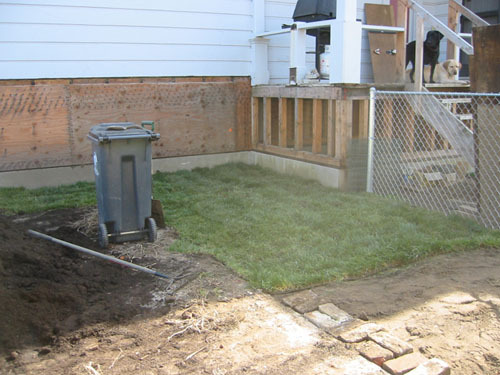 We had raised the height of the path with extra dirt from the front yard, then we graded the ground to make a shallow area to either side of the path, for drainage, and I put in a small brick transition area for decoration. Because we have an unbelievable number of bricks. 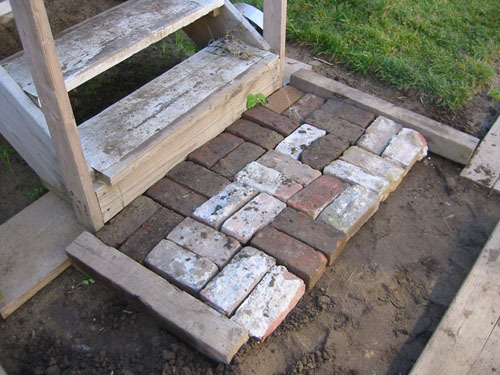 After we added soil to bring the path height up enough to allow it to drain, I used some bricks to make this stoop at the bottom of the side stairs. Neither stairs nor stoop are staying there, but the stoop makes it a bit easier to clean your feet off. 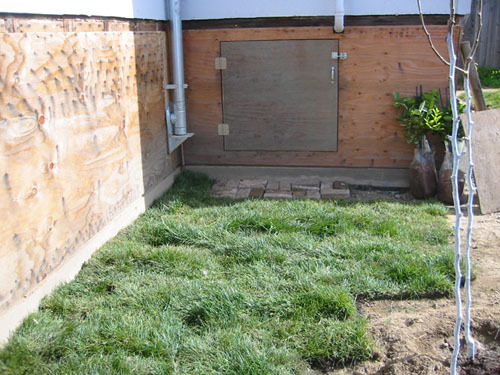 We added some soil and put some sod by the basement hatch, to make getting in and out of the basement less muddy. I made another brick stoop there, too, to replace the piece of plywood we had been using. 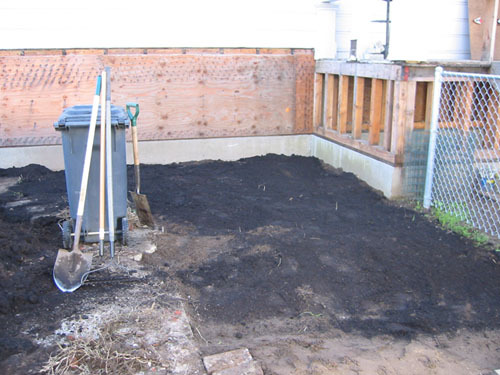 When we finished filling in sod around the house, most of the holding area was empty. 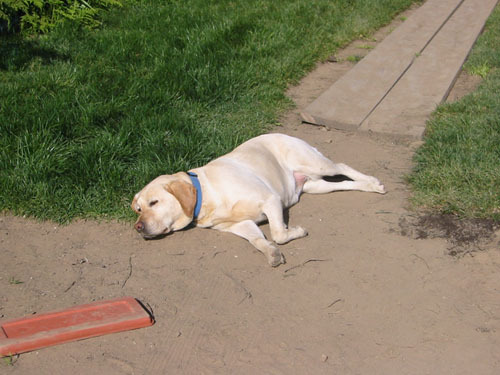 This is a good thing, because our next big landscaping task is to do the pathways and small patios around the garden, and the grass would have been in the way. 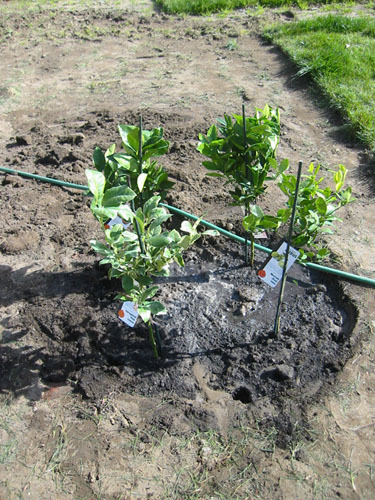 Here are the citrus trees, finally in the ground. They're a variegated pink lemon, a pink navel orange, a key lime, and a blood orange. I ordered the larger trees from Four Winds Growers. I wanted to buy them locally, but as it turned out nobody carried the Cara Cara orange or the key lime. Which I find amazing, but whatever. This is one of the random extra roses I got. The only one that is not a variety I ordered at all. It's Mme Alfred Carriere, a vigourous climber. 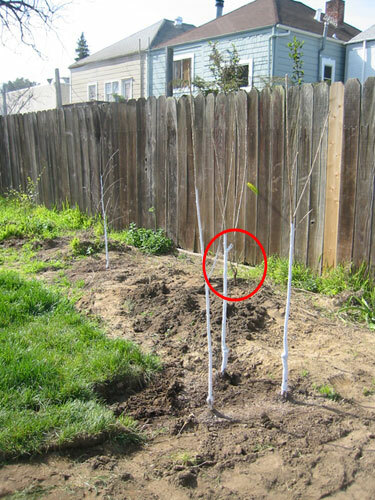 So I put it by the somewhat ugly fence near the apple trees. We'll string some tension wire for it to grow on, and all will be well. Another bonus rose I could not fit in in the front bed was Constance Spry. I had planned on one, paired with a Gertrude Jeckyll on either side of the entry (trained over an arch, I'm hoping, if I can find an arch the right size). I really didn't have room for two of them in the bed because they get really huge. So I put it between the sweet cherries and sour cherry, by the fence. It's hard to see in this photo, so I circled it. 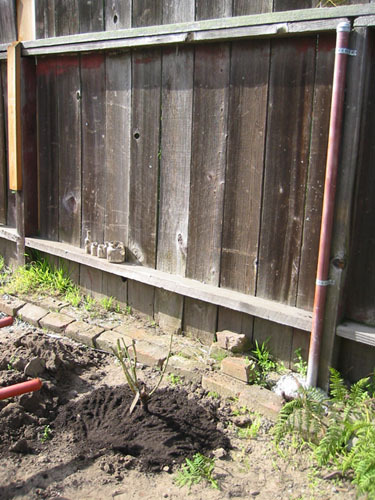 I needed room to let it grow and I figured that hiding the fence is an admirable task for a bonus rose. Unfortunately, this is a spot I was planning to save for raspberries, but we can't have everything. I'll have to find another place for them. Yesterday was a long day for the dogs to be outside, so early on in the afternoon today they wilted away and found places to sleep. 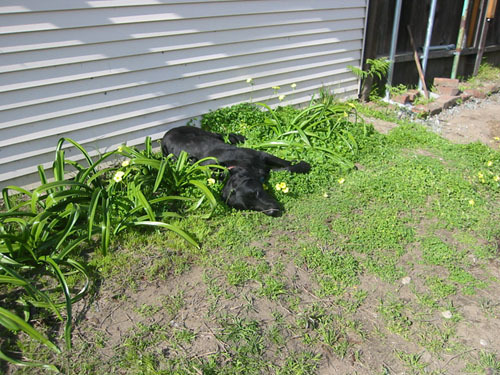 Rosie has a marked preference for sleeping in the oxalis and amaryllis. Whereas Goldie quite sensibly socked out right in the middle of the path so we couldn't go do anything potentially interesting without waking her up. 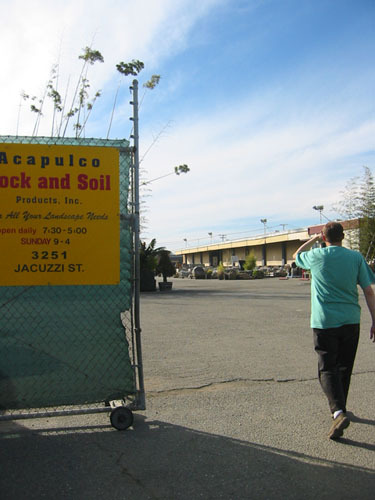 In quest of the perfect path material, we made an afternoon field trip to our favourite supplier of compost: Acapulco Rock and Soil. They had some interesting stuff, but I really want a path that looks like the shell paths that were original to the house, and that are appropriate for the period. I'm not doing a period garden, but as with the interior, I want the hardscape to be close to what would have been used originally. They didn't have quite what I wanted, so we're going to check out some other places, too. Our last project of the day was replanting the magnolia that has been potted in a recycling bin for the last year. For some reason, I always seem to be planting that tree at night. 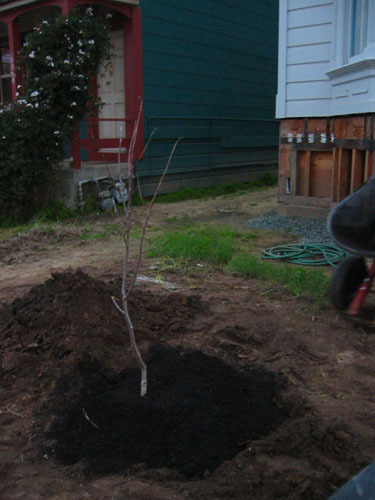 It was quite an effort, but it was nice and very symbolic to me to get it in the ground and give it lots of compost to make up for the last year of suffering. I'm a little late on this, but American Soil Products in Richmonds is good for stone &c. Also, I've seen Cara-Caras and Key Limes at both Berkeley Hort and the Emeryville Home Depot. And East Bay Nursery, I think. ASP is good for stone, but doesn't carry compost. I should remember to go by there and see if they have path fines in the shade we want. I generally have a prejudice about buying plants at Home Depot, so I didn't check there, but when I called Berk Hort they had only the Key Lime. Maybe it was too early in the season. 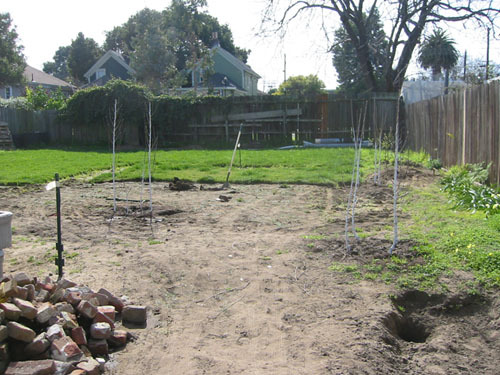 For whatever reason, I always forget East Bay Nursery (when we lived in Berkeley we were a hop skip and jump from the Dwight Way Nursery so I always went there, and yes, I realize EBN is right around the corner). I just popped over and looked at your site; I'm going to have to go back and read more when the quarter is done. I agree with you about the Depot, or at least I did until I noticed that all the citrus trees there (as at every other area nursery) came from Four Winds. Another place to check out is Orchard Nursery (not OSH) in Lafayette. They had a really nice selection of bareroot trees in January. Thanks for the plumbing info and the nice comments. Well, I called to have compost delivered and they told me they didn't carry it. I'd had them recommended to me several times by gardening friends and was surprised that that was the case, but I can assure you that that was what they told me. Love Love Love your blog !! !